This is a must to visit. This pleasant city is easily reached and parking is not too difficult near the spectacular Cathedral. The excellent Toulouse Lautrec Museum is next door, with a collection of the works of the famous artist as well as a gallery housing contemporary works of art. Albi is both attractive architecturally and abounds with interesting shops. The Gothic Cathédrale Ste-Cécile of Albi, built in the 13th century in the heart of Cathar country, is the largest brick building in the world. Perched high on a hill, it looks more like a fortress than a cathedral, and that’s no accident (Fortified with ramparts and parapets, construction on Ste-Cecile Cathedral began in 1282 by the lord-bishop of Albi. It was built as a defensive fortress and statement of strength after the Albigensian Crusade (1209-1229), waged by the Catholic Church against the Cathars and the count of Toulouse. Construction on the cathedral was not fully completed until 1480.
Notable exterior features of Albi’s Cathedral include the rich portal of Dominique de Florence (c.1392), the 78-meter-tall dungeon tower (finished in 1492)), and the baldaquin of the entryway (1515-1540). There is a programme of free concerts on Wednesdays and Sundays in July and August. Nowhere else in the world can one enjoy the richest and most varied collection of the works of Henri Toulouse-Lautrec, born in Albi in 1864. Thanks to the generous donation of his works from the artist’s parents to the city of Albi, the visitor is able to fully trace the evolution of the painter’s career, from his early works to the later masterpieces. The Albi circuit has 70 years of experience in organising motor-racing events, and its Grand Prix has been running for nearly as long. Racing amateurs and the rich and famous will come in their droves in September for the Grand Prix which is the main event of the year of the Racing Circuit of Albi. It is one of the oldest dwelling-houses in the city. In the 1970’s, this building was to be destroyed but it was saved and restored in 1970 to its former glory. This old Albi house is typical of the mediaeval period and uses both brick and timber-frame construction techniques, its main features are the open attic storey or «Soleilhou» used for drying pastel, and other produce such as grains, the half-timbering, the corbelled upper floor, where the living quarters were, projecting out over the street to make more room space. All year round, this house is host to exhibitions on the architectural heritage of the area and there is a slide-show featuring Albi and Cordes. The Maison du Viel Alby is the local headquarter of the Association de Sauvegarde du Patrimoine (Heritage Conservation Society), which instigated its restoration. Just outside this museum, there is a shop where you can buy pastel and all the by-products. 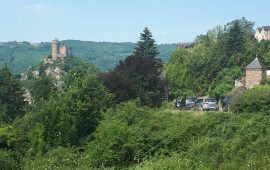 • the Purple Circuit : a 90 minutes circuit to get to know the heart of Old Alby- its historic figures and buildings, its monuments – all witness to Albi’s glorious past. • the Gold Circuit : a 90 minutes circuit to discover the different stages of Albi’s development through its beautifully restored old town centre and its 20 centuries of history. The château, which is open to visitors, was built on 6th century foundations although other buildings date from the 12th and 15th centuries. Benefiting from its geographical situation, the city prospered in the Middle Ages as it constituted a crossing point for the merchants and a halt for the pilgrims on the trail to Santiago de Compostela. The faithful followers were accommodated at the hospital Saint Catherine, opened in 1303. Many residences are of stone and wooden construction, with half timbered facades and detailed corbelling, some dating from as early as the 14th Century. Evidence of the historical prosperity of Bruniquel can be seen in the decorated turrets, sculptured stone doorways and carved figures. The church was destroyed during the religious wars but was rebuilt in the 17th Century and further altered at the 19th Century. No matter which direction you come from, the sudden sight of the town built high on top of an isolated knoll, will always take your breath away. 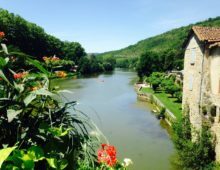 If you visit early or late season, you may be lucky enough to see why it was renamed in 1993, from Cordes to Cordes-sur-Ciel. Low cloud and mist often shroud the valleys in this area and at this time Cordes appears above the mist and seems to float in the sky, bathed in sunlight. 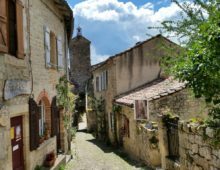 This medieval bastide, like so many in this area, has been shaped by history. Before 1209 Catharism was widely adopted in Cordes, but after being declared heretical the inhabitants suffered cruel persecution. There is a plaque to commemorate an incident in 1233 when revolted by the fact that a follower was condemned to burn at the stake, the inhabitants of Cordes are said to have thrown the three inquisitors down the well in the market place. Only in 1321 would it finally submit. In spite of all this, Cordes was to experience, during this period, a phenomenal growth. In three generations, it became an important town numbering more than 5,000 inhabitants. Its prosperity sprang from the cloth, wool and leather industries, trading and finance. In 1348, the black plague hit the town. It was to wipe out a quarter of the population. Seven years later, the Hundred Years War led to the English occupying the land as far as the neighbouring hills. From 1562, the Wars of Religion, that saw Catholics and Huguenots (Protestants) fighting each other, were to bring continued difficulty. The fortified town, which was considered to be the best stronghold in the Albi region, became the object of jealousy by the Huguenots. In 1568, it was besieged, plundered and partly burnt. At the end of the 17th century, the construction of the Canal du Midi completely changed the major trading routes and brought a collapse of trade in Cordes. The town now found itself off the beaten track. Stuck on its rock, it sank into oblivion. During the 1848 Revolution, it was renowned as a “Republican town”. It was a rural town away from the main communication routes, and was not part of the industrial revolution of the 19th century. Yves Brayer and his friends, the sculptor Bizette-Linder and Albert Bouquillon, were amazed by Cordes beauty and authenticity and moved there in 1940. Other painters, sculptors, poets and writers came to join them. They founded the Cordes Academy whose exhibitions are well known throughout the south-west of France. These days there are about fifty artists and craftsmen. There are numerous guided walks you can pick up details of at the tourist office. There are numerous festivals throughout the year, but particularly July and August. A fun one for all the family is the Medieval Festival of the Grand Fauconnier where visitors are encouraged to join in the fun by dressing in medieval costume and then enjoying the spectacles of street theatre, demonstrations of medieval crafts and also see local birds of prey. For music lovers then the Classical Music Festival is a must, with concerts held throughout the town in exquisite settings. Children tend to really love the Jousting Tournaments held on the outskirts of the town where they can cheer on their favourite. The Jardin des Paradis is at the foot of Cordes it welcomes visitors and offers them a chance to relax. The garden comprises of a collection of areas, each with a different atmosphere, theme or colour to entice all your senses. Founded in 1144 in the charming valley of La Seye near Ginals, this medieval abbey was prosperous for several centuries and survived despite the Albigenses Crusade in the 13th Century, the Hundred Years War in the 14th Century and the War of Religions in the 16th Century. The Abbey went into decline only to be sold during the French Revolution when it was partially demolished before becoming a farm. The property was bought with the assistance of the state in the 1960s and restored. It has been home to a respected collection of contemporary art since 1973. Situated a short drive from Albi, Gaillac is a real gem of a town. It is historically interesting, and beautiful with its ancient buildings straddling along the banks of the Tarn. It is more compact, less crowded and has a much more intimate feel than nearby Albi. There is an excellent walking route round the town taking in most of its important sights- maps available from the tourist office in the town centre. The Abbey Saint-Michael is the most prominent building, with the Abbey Museum, Maison de Vin, and tourist office all in the vicinity. Wine tasting sessions are held at the Maison de Vin [ a good alternative to visiting a vineyard if time is tight]. There are many other buildings of note including the 13th century Church of St Peter with its hexagonal tower, and the beautiful 17th Chateau de Foucaud sitting in stunning formal gardens and a park that borders the river. The latter also has the excellent Musee des Beaux-Arts in its grounds – a small but lovely art gallery with many interesting paintings and sculptures. Gaillac makes a very good place to visit on a circular trip incorporating a visit to a vineyard en route, and possibly stopping off at pretty village such as Castelnau-de-Montmirel, or a visit to the Chateau Mauriac [ a renovated castle with fantastic internal decorations]on the way back. This is a lovely small medieval bastide village, almost perfectly preserved, and with a selection of good restaurants in its centre – the Place des Arcades. It is rightfully one of the ‘Plus Beaux Villages de France’. Well worth a visit. The chateau was built on a French / Roman mound at the end of the 13th century. During the Hundred Years’ War, the castle was often attacked by the army of the Black Prince, but, thanks to its excellent fortifications, it withstood all attacks. After the defeat at the Battle of Crecy, however, the castle fell into the hands of the Black Prince. According to legend his treasure was buried somewhere on the castle grounds. During the religious wars, Queen Margot, wife of King Henry IV, left Paris, accompanied by her two lovers, and travelled to the Chateau of St. Project where she was welcomed by the lord of the estate. After their departure from the castle, the Queen’s bedroom was locked and it was as late as 1990 that it was again discovered with all its furniture. A charming small town on the other side of Montauban with a pretty town centre and Abbey. The Abbey portico is very impressive, and the cloisters are considered to be the finest in France- a must for those interested in ecclesiastical history. There are several friendly restaurants selling a variety of cuisines in the town centre. Montauban, founded in 1144 by the Count of Toulouse on the banks of the Tarn River, is made from the attractive pink stone found in the region, like its great southern cousin Toulouse. The town does have quite a bit of urban sprawl, which perhaps doesn’t create the best impression on arrival – but be sure to continue, for the town centre is very impressive! The highlight of the town is at the centre of the original bastide – the Place Nationale. Surrounded by grand pink houses, in the red-brick that is common to the region, and set above fine arcades, it is a very attractive central square. It was largely rebuilt in the 17th century after a fire. The arcades of are an unusual ‘double’ construction – one set of arcades near the house/shop fronts and another closer to the square. Complete on all four sides, this central square in Montauban is one of the most impressive to be seen in all of the bastide towns of south-west France. Be sure to take refreshments in one of the cafes that line the square, then wander around the surrounding streets a little, and past the Church of Saint Jacques – an attractive 13th century church with a square tower and an impressive mosaic entrance. 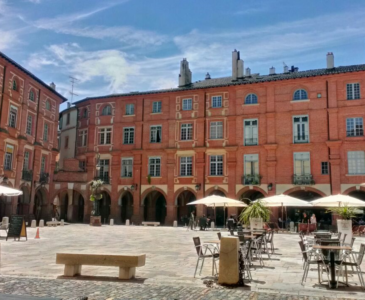 Following the traditional grid pattern of a bastide town, the straight streets of Montauban town centre now form a lively shopping centre, with lots of interesting features and buildings to discover. Keep going until you reach the river to see the lovely old bridge – and old it is, having being built around 1303-1335, much older than most ‘old bridges’! The town beyond the boulevards that surround the central old town Montauban is less interesting for visitors. You can also visit the Museum Ingres to see the works of Ingres and another local artist called Bourdelle. The museum is found in the palace built on the site of the palace that was occupied by the Black Prince during the Hundred Years War, and you can see remains of the original building in the basement of the Museum. Fabulous medieval village, rated as one of the most beautiful villages in France with a ruined castle where the English laid siege. 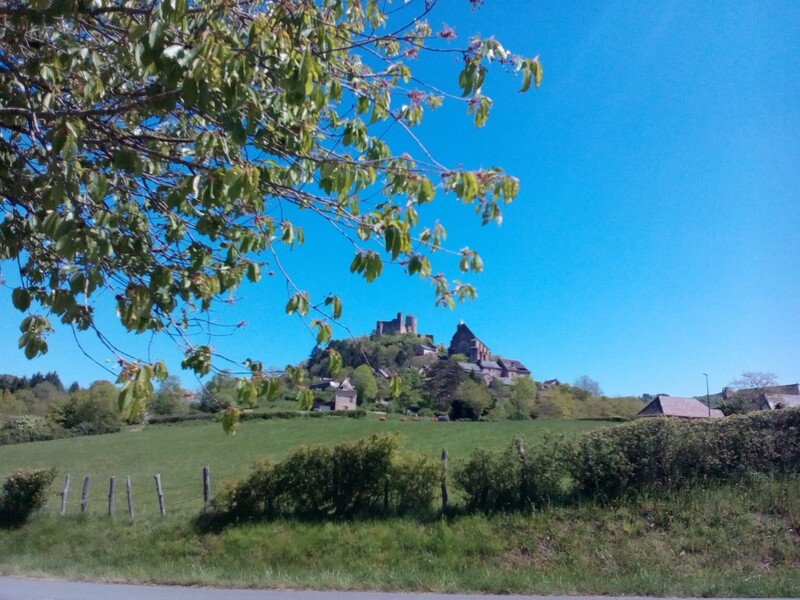 Najac occupies an extraordinary site with the main street leading to the Chateau on top of a conical hill giving the impression of the backbone of an ancient animal sleeping. In 1258, because the inhabitants of this bastide town widely accepted Catharism it is said that the Church of St Jean at the foot of the Chateau was built by the villagers as punishment by the Papists for their conversion. You can explore the Chateau with incredible panoramic views and there are numerous small shops and restaurants in which to while away the time. Situated at the heart of Aveyron, Rodez offers the chance to discover a two thousand year old town, rich in history and heritage. Should you wish there are a number of guided tours (conducted in French) that will let you explore the Cathedral de Notre Dame, the Gothic masterpiece whose 87-metre high bell tower dominates the town and is among the most beautiful in France. 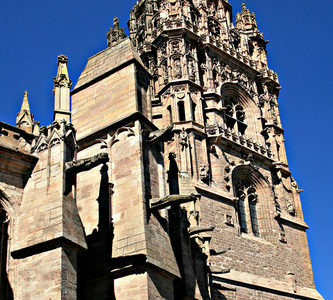 Any visit to Rodez should also take in the glorious 16th century Carthusian monastery which is now home to the French National Stud Farm – open to the public during the summer; the Musée Fenaille which boasts a collection of Menhir statues unique throughout Europe, as well as the contemporary sculptures of Denys Puech. Throughout the year – summer and off-season – Rodez hosts a packed calendar of events and spectacles. Discovered in 1965, then fitted out and opened to the public in 1973, the Foissac cave constitutes a remarkable natural subterranean museum. As head of an active hydro-geological network explored for up to 7kms, the section that is fitted out for tourism is isolated from the other galleries by some impenetrable screes. A study has been conducted by a multi-disciplinary scientific team on the human and animal footprints and pottery discovered on site. The most important objects have been preserved where they were found. This park also has a great reconstruction of a Copper Age settlement – an unexpected gem. Please remember that the caves are at a constant 12C and you will need warm clothes to enter them, there are some blankets available. The cave can be found (sign posted) on the right hand side of the road between Villefranche and Figaec, past Villeneuve. This medieval town on the banks of the River Aveyron has a wonderful range of buildings and alleyways, leading to the central Place de la Halle – where the vibrant weekly market is held on Sunday mornings, although it spills over in to all the roads of the town in the summer. The architecture still displays the scars of history. Legend has it that when Saint Antonin was beheaded after his unsuccessful conversion to Christianity of the people of his home town of Pamiers, the angels descended from heaven and placed his body parts in a boat that flowed, miraculously, along the Garonne, Tarn and Aveyron; at the confluence of the Aveyron and the Bonnette the corpse was retrieved by Festus, Count of Noble Val who placed the relics in a shrine. In the 8th to 12th Centuries St Antonin Noble Val was prosperous, but then came the spread of the Cathar doctrine and its persecution during the Albigensian Crusade which led to the siege and partial destruction of the town and abbey in 1212. St Antonin Noble Val again prospered until the 14th Century brought the Hundred Years War and as the town was on the boundary of the war between the English and the French it suffered greatly; after a siege of two years, it was occupied by the English for 9 years. The ravages of war and plague had a devastating effect. Prosperity gradually returned to St. Antonin only to be lost again by the War of Religions which resulted in 1562 with the Papists being driven from the town which declared itself a ‘Protestant Republic’. It was another hundred years before both Protestant (Huguenots) and Catholic communities were able to live harmoniously, though this was interrupted by the inquisition when Protestants were expected to denounce or flee. Once again in the 20th Century St Antonin suffered during the World War II under German occupation. The town was used as the film location for ‘Charlotte Gray’ and recently released ‘The Hundred-Foot Journey’ starring Helen Mirren. 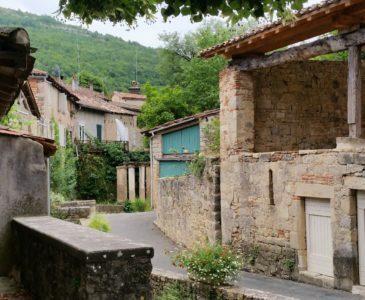 Situated a few kilometres beyond St Antonin, the village of Penne boasts a fantastic ruined castle whose ‘keep’ teeters out from the side of a rocky pinnacle at an apparently impossible angle. There is a dramatic drive up to Penne along a mountainous road with fabulous views, and hair-raising bends. The castle had fallen into disrepair, but restoration work has begun  using traditional methods and equipment. Hence you can watch how medieval stonemasons worked, and used original lifting gear etc [all traditionally dressed]- great for kids. The village is pretty with some good restaurants too. The ‘trademark’ of Toulouse is perhaps the small pretty pink bricks with which many of the houses and important buildings have been constructed, which seem to change colour as the day (and the sun) passes. Hence the city is often referred to as the Ville Rose (pink city). These bricks are also often combined with the local white stone to create a decorative effect. There is a great deal of interest to explore and discover in Toulouse. Start your visit at the central Place du Capitole, a large open square in the heart of the city (with convenient parking underneath the square). 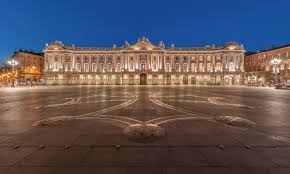 The grand building with eight columns on one side of the square, in the characteristic pink brick of the town, is the Capitale du Toulouse, the head of local government and dating from 1750. From here head towards the Garonne river, passing by the ‘old Toulouse’ where grand houses line the streets. The Garonne River passes through Toulouse, and the river banks are often tree lined and a pleasant opportunity to amble in peace, and escape from the bustle of the city. You will also note the impressive 16th century arched pont-neuf (translation: ‘new bridge’ although it is now far from being new) – the arched bridge – most impressive, even this bridge manages to incorporate some of the local pink brick! The Canal du Midi, world heritage site, also passes through Toulouse and has pretty shady banks where you can take a stroll. There is also the Museum of the Augustins in Toulouse. Not just a very impressive collection of art from the last eight centuries, it is also housed in a very attractive building – most notable perhaps is the cloisters of this ancient convent. Saint-Sernin church, a substantial 11th century roman style church, is perhaps best known for its tower, with five octagonal levels each pierced by ornate arches, and is one of the finest buildings in Toulouse. This church, along with the Hotel-Dieu Saint-Jacques, also form part of a UNESCO world heritage site, being on the pilgrim route to Santiago de Compostella. In medieval Toulouse there are various other churches to discover as you travel around. If you like museums – well, Toulouse has plenty! From fine arts to modern art, from antiques to natural history, you are sure to find the museum that covers your interest. This is a new museum set in a renovated slaughter house, and combines permanent exhibits, with works by many of the most famous artists of the 20th century, with interesting temporary exhibitions. Also very popular attraction on the edge of Toulouse is the Cité de l’espace, which combines modern 3D cinema ‘space’ experiences and children’s learning experiences with a hands-on chance to see and touch some genuine examples of spacecraft. Villefranche-de-Rouergue is unusual among the 13th century bastide towns in the south-west of France in that it is very largely uncommercialised. It comes very close to being a ‘typical French town’. Perhaps this is because it is a little off the beaten track – there are few other large towns close by. (This has led perhaps to a bit too much low-rate development on the edges of the town). There are two main streets in the town, both attractive, that lead to the main square. 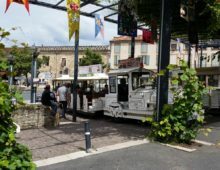 The square itself is an almost perfect bastide town centre, with intact arcades around the edges of the square; and attractive medieval houses above. The square is also on a slope, so you can look down on the lower half. The houses surrounding the square are taller than those found in most other bastide towns. One corner of the square is, to say the least, dominated by the church and its oversized bell-tower and entrance porch – take a look at the 15th century stained glass windows in the church. Also well worth a look are the Chapelle des Penitents-Noirs with exquisitely painted interior and the Chartreuse St-Sauveur (just out of town on the Gaillac road), which has a lovely cloister – one of the largest in France – and some good woodcarvings on the interior stalls. You should also wander down to the river, and take a look at the ‘old bridge’ and the riverfront. This is our nearest big town. You will find there is a wonderful large market on Thursdays with local produce which fills the town centre. There are plenty of shops, restaurants and cafe/ bars and this medieval town is worth exploring. Edward was born on 15 June 1330 at Woodstock in Oxfordshire, the eldest son of Edward III. He was created Prince of Wales in 1343. He showed military brilliance at an early age, playing a key role in the defeat of the French army at the Battle of Crecy when he was only 16. In 1355, he was appointed his father’s lieutenant in Gascony and the following year led another significant victory against the French at Poitiers, taking the French king prisoner. In 1362, Edward married Joan of Kent and was created prince of Aquitaine and Gascony by his father. Edward and his wife went to live in his new French domains. In 1367, Edward led an expedition to Spain, to restore the deposed King Pedro of Castile, and proved himself again with victory at the Battle of Najera in northern Castile. Edward returned to Aquitaine, where he made himself unpopular with the nobility by levying taxes to pay for his Spanish expedition. They rose in revolt against him and in 1370 Edward besieged the city of Limoges. When it fell, 3,000 of its inhabitants were massacred. A year later, Edward returned to England and died aged 45 on 8 June 1376, probably from an illness contracted in Spain. He was buried in great splendour in Canterbury Cathedral. His young son, Richard, succeeded Edward III a year later. This conflict between England and France started in 1337 and lasted 116 years, but describes a collection of conflicts with short periods of peace. The two main causes of friction between England and France were Flemish trade, which was dependant on English wool, and Gascony, held by the kings of England as vassals of the kings of France. The exact nature of that relationship had caused conflict before, but the Hundred Years War was intensified by Edward III’s legitimate claim to the French throne. The effect of the war, famine and epidemic is thought to have reduced the population by two thirds. The infamous French Wars of Religion were a series of wars that took place in France over a span of 36 years, between 1562-1598. They were mainly fought between the French Catholics and the French Protestants or Huguenots. French noble families of the House of Guise and the House of Bourbons were also involved. Historians are of the opinion that it was a proxy war between Queen Elizabeth I of England, a Protestant and King Philip II of Spain, a Catholic, as both of them are said to have contributed financially and militarily to these wars. There were actually 9 separate wars during this time, and one incident sparked it off. A group of Huguenots were attending a service of worship in the town of Vassy. In those days, attending a Reformed worship service in public was considered illegal in France. Francois, the 2nd Duke de Guise House of Guise, who was close to the royal family, happened to visit the place of worship with some of his armed men. He first asked the worshipers to stop the prayer. But they refused to obey and continued with their prayers. This angered the Duke, who along with his men started killing the unarmed Protestants. Louis de Bourbon, who was the leader of the Huguenots, ordered the Protestants to retaliate. This incident which came to be known as the ‘Massacre at Vassy’, started a civil war that spread across the whole of France.